I would choose this venue a hundred times over and will be recommending it to every bride I know. I chose the full coordination route with Sister Events at Cedar Skies and was absolutely blown away. Manda and Maegan made the entire wedding planning process so easy and fun it was unreal. Any little stress I had a question about, they already had the answers to. Sister Events and Cedar Skies made the best day of our lives literally a dream come true. It was perfect! I trusted them, and they more than delivered. The details were impeccable and they were extremely professional and easy to work with. 11/10 recommend!! Made my daughters day go very smoothly, was the best decision I made was to have a wedding coordinator and Manda and Megan made sure that every detail was on spot. I was able to just sit back and enjoy the day with my baby girl. Thank you so much for making this day so special for both of us. Responsive, Kind and Helpful in a Pinch! Maegan and the entire staff at Cedar Skies was amazing! Our original wedding venue flooded and closed ONE MONTH before our wedding! 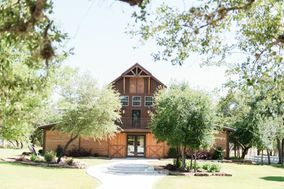 Cedar Skies had an opening and worked with us to rearrange our wedding day and lodging for over half of our guests. They were so understanding, kind and provided great customer service. The venue is beautiful and breathtaking. 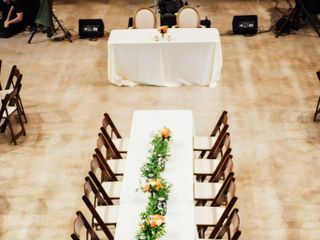 We are so lucky we were able to find such an incredible space so close to our wedding. They were flexible with our vendors, timing and responded quickly to all questions/concerns. Our wedding day was perfect and it is in huge part to the beautiful venue and Maegan's help! We are so glad we had an open date after the flooding of your original venue. It ended up being a perfect day and we look forward to you and your guest returning for a vacation! Hill Country Beauty and MUCH more! We had our wedding at Cedar Skies in Sept. 2018. This place is way more than your average venue!! ALL of our guests were from out of town, and 90% choose to stay on site. We made the wedding a week long activity, and it was so relaxing and enjoyable to be able to spend time with family and friends before and after the big day! Log Country Cove offers beautiful cabins, fun lakefront activities, and even boats and water toys for rental. (Plus no one has to drive home after the wedding/festivities). Many of my guests are trying to plan a return trip just to enjoy it with their families. As for Cedar Skies, we worked with both Maegan and Manda to tour and set up the venue. They were both great, very responsive to any questions or concerns. We really wanted to have an outdoor wedding, but the day of our wedding Mother Narure was not cooperating. Maegan kept an eye on the radar and waited until the last moment we could to make the decision to move it inside. They set up the chairs inside for us and it was a perfect set up. The wedding was flawless and it downpoured during our nuptials, so moving inside was a good call! The rain let up after the wedding, and due to the great drainage and landscaping we were still able to go outside and get some great pics! If you are looking for a location that captures the beauty of the Texas Hill Country and provides the perfect place for your friends and family to stay, Log Country Cove & Cedar Skies is your place! Thank you for the kind words! Your wedding was so beautiful, even indoors!! Thank you again for choosing Cedar Skies and Log Country Cove. Come back and see us! Such a beautiful Texas Hill Country venue! The outdoor setting for the ceremony was gorgeous. The Cedar Skies Barn is a perfect combination of elegance in a rustic country setting. The guest accommodations offered on the property are all lovely. I can't say enough good things about the event coordinator who helped plan every aspect of the event. No matter what we asked for she found and provided it. She chose all of the vendors and made sure they understood what was requested. Our family and friends all commented on what a wonderful party and magical event they had attended. Overall, our fairy tale came true! It was such a joy to have you and your family celebrate your special day with Cedar Skies. Please come back and visit us at, Log Country Cove. Gorgeous wedding and fantastic food! The venders Cedar skies used were amazing. They made the wedding so easy. Kelsea and Harrisons wedding was perfect. The staff of Cedar Skies are talking about how polite the guests were and wonderful the bridal party was. So happy to have had such a wonderful group of people!! A blessing and a "godsend"
Manda with Sister Events and Log Country Cove was such a blessing and a real "godsend" for us. My son a missionary in Cambodia and he was home in Austin for only a few months, with grand plans to propsoe to his lovely lady on Dec 21st and then marry before returning to Cambodia. With the proposal behind us, the holidays over and a Feb 10th wedding date set. We set to planning a wedding , we needed to find a venue and plan a the whole wedding in only a few weeks and all went beautifully as as planned with surprisingly very little stress thanks mostly to Manda, her team and their beautiful venue Cedar Skies- this really helped thier dreams come true. She made it so much easier on both mothers and the bride and groom. She took away our anxiety with her expereince, patience and confidence. She is very knowledgeable, and offered tons of great advice and helpful suggestions to cut down on stress. She is/was so sweet and loving and was very patient through the whole process, she gave us confidence that even though we didn't have a long time to plan we didn't need it , because she would take care of all the details and she did! She promised it would go smoothly under her watchful eye and it did! One thing she couldn't control was the weather ... the ceremony was all set up outside which was so inportant to the bride and groom to have an outdoor ceremony and just hours before the ceremony an unexpected cold front moved in and we experienced a 20 degree drop in temperature just an hour before. But no panic , Manda offered a helpful solution to send her sister and partner Meagan to Tueday Morning to buy every lap blanket we could- Guests later reported that really was a real life saver as it was very cold. Another example of her thoughtfullness, attention to detail and quick thinking is when during the ceremony the couple had planned to wash each others feet she orchestrated helpers to heat the water to make the bride and groom more comfortable. Later after the ceremony we all moved into the welcome coziness of the beautiful Cedar Skies lodge and the wedding continued. A very special day indeed in part to having a wonderful co-oordinator take care of so many details. Her experience, thoughtfullness , quick thinking and being willing to go the extra mile is what makes the difference between "good" and "great" service and Manda, Maegan and thier team are "Great" in my book. Thank you so much for the kind words Susan! What a beautiful day that we got to experience between two wonderful people! God is so good!! We loved our experience with Cedar Skies and with using Sister Events to coordinate! Working with a control freak like myself can be difficult at times, but Manda and Meagan handled it like the professionals that they are, and the results on the day of, were wonderful! Go see the venue, because the space speaks for itself. Do yourself and your stress level a favor and get Sisters events to plan the day! The sister events team was BEYOND our expectations!!! We have them an idea of what we wanted and our budget and they ran with it completely to make it a fairytale weekend!! The most beautiful venue and resort in Texas! It's extremely nice to have everyone in one place to celebrate together and to top off the best coordinators and venue around! Everyone should use them to make their wedding vision come true!! Your wedding was a dream. You had a beautiful idea of what you wanted your wedding day to be like and we were so happy to get to host the wedding and plan. Fairytale wedding is exactly what this day was. Thank you again for choosing Cedar Skies. Come back and see us! 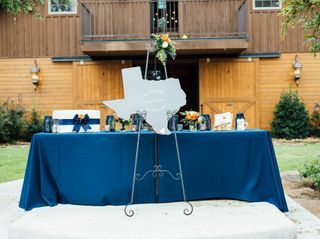 We had the best experience last weekend with our wedding at Cedar Skies, the rehearsal dinner put on by Sister Events, and all the wonderful lodging on the property. Everything was perfect, beautiful, organized and done with such love. Maegan and Manda are the best coordinators and so sweet and fun to work with. All of the preferred vendors were amazing! I can't say enough to describe our awesome experience for the whole weekend. Thank you! WHAT A DAY!! Thank again for choosing Cedar Skies and Log Country Cove for you and your family to enjoy. Y'all are like family to us now, so come back and stay with us!! Wonderful experience. Beautiful setting and lovely people to work with. I highly recommend using this for any gathering. Loved this venue. Loved working with Meagan and Manda. We would definitely recommend! Thank you for the review. What a wedding you planned! Come back and see us, we'd love to see y'all! Manda planned my wedding and did a great job! I had no idea what I was doing so I really relied on her for so much and she exceeded my expectations. 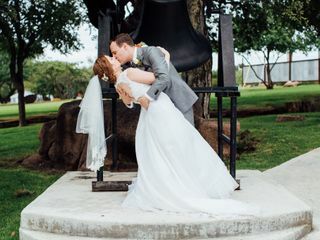 Every email, text, phone call was promptly answered and my wedding turned out beautiful! The place alone is so awesome that our friends and family kept talking about how they can't wait to come back for vacations! It was so fun watching this wedding unfold. Your idea was perfect and different! We love unique ideas and we are so happy with all the photos. :) Come back and see us!! Cedar Skies went above and beyond for our wedding. Every detail was perfect! I could not have imagined a more beautiful and wonderful day! Thank you for the review. 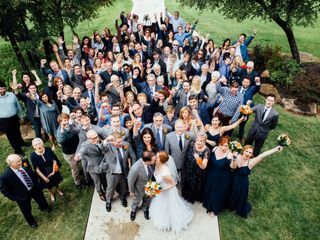 Ohio and Texas came together for a HUGE celebration and what a day it was!! Come back and see us! My husband and I had the fairy tale wedding day. The onsite log homes are stunning and the perfect place for you and your guests to stay, relax, and enjoy your special time. The property has endless things to do and beautiful views. My family and I decided to celebrate the entire week and stayed at Log Country Cove for some vacation time before the wedding. Sister Events made the planning process and day of 100% stress free. I lived across the country so having help with wedding planning was important. Maegan handled everything! I simply sent ideas or pictures of what I liked and she did the rest! She was available anytime whether it was phone call or text. She remembered all of my random ideas and made sure everything came together. Manda was super helpful the day of especially during pictures where she lent advice on where and how to stand. My husband and I certainly needed the creative eye and she was totally right, our pictures turned out awesome! Cedar Skies barn is absolutely beautiful. If you're looking for a flare of rustic it's the place for you. If you're looking for classic elegance it's the place for you. Whatever your vision Cedar Skies and Sister Events will make it happen for you! Also, for those of you who want an outdoor summer wedding but your worried about the Texas heat...don't fret! My husband and I got married in August. The grass was GREEN and the trees provided shade. I highly recommend this venue! The options are endless and the staff is amazing. Manda and Maegan were quick to make adjustments with the rain and create a ceremony more beautiful than I could have ever imagined. They are full of fun ideas and make planning so much easier. Oooh how I wish we could relive our wedding day again and again! Cedar Skies was an AMAZING place to have my wedding. All of my friends and family loved the venue and had an amazing time. Maegan and Manda were awesome to work with and very accommodating. It was the perfect wedding spot & they had all the details covered. Beautiful Venue! Wonderful Staff! Great Wedding Coordinators! The entire staff out at Log Country Cove are such a pleasure to work with. They are always so accommodating and always ready to lend a helping hand if another vendor needs their help. We love working out there with Manda and Maegan. Great to work with! So accommodating and friendly! The venue is stunning and clean and classy! Great way for family and friends to to and enjoy the weekend with all of cedar skies lodging that's available. The Wedding coordinator's are amazing at their job and make the process so simple and carefree and allow you and your family and friends to enjoy your big day! Best experience ever! The team went above and beyond to plan my dream wedding! It was like working with a family you’ve known forever. I wouldn’t have changed anything! The team at Cedar Skies is amazing!! They were so attentive to every detail and you could tell they truly love the work they do. Throughout the entire planning process, Manda and Maegan were there for me and answered any questions that I had. They are very knowledgeable about the market and have impeccable taste when helping design your big day! They made my wedding day everything I could have imagine and more! This was such a perfect venue for my wedding, and I highly recommend it. 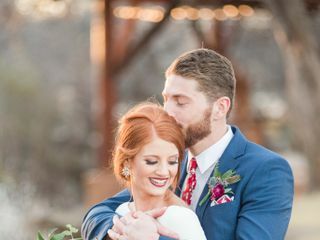 I was looking for an outdoor venue in the beautiful nature of the hill country with a nice, climate-controlled indoor area for the reception. It seemed like every other outdoor venue I checked out was a barn, and each was brimming with cow skulls and rusted metal. That was not the vibe I was going for. Cedar Skies was the only place I found that seemed to fit the relaxed yet elegant outdoor/indoor approach I wanted without going overboard into cowboy territory (although, if that is your thing, it could so easily be worked to fit that style, as well!) Yes, it’s a “barn”, but I didn’t immediately think livestock when I walked in, and for me, that was a good thing. It was beautiful, comfortable, and classy. The grounds and the barn itself were immaculate and gorgeous. The structure really highlighted and also enhanced the natural beauty of the area. 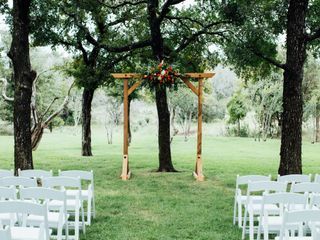 I held my ceremony in a clearing ringed by oak trees and a little creek next to the barn. The trees provided wonderful shade for the audience, and I was so grateful that I wasn’t forcing my guests to swelter out in the sun. The staff here was wonderful, and I couldn’t be more grateful to them for the use of their beautiful venue and all they did to help me have such a lovely day. Every detail was attended to, even down to them cleaning the windows before the guests arrived. Manda and Maegan were wonderful and knowledgeable with everything leading up to the day itself, and on the actual day of the wedding, Maegan went way, way above and beyond to ensure that everything went off without a hitch. She helped me in countless ways and really brought things to another level of professionalism. These folks know how to have a wedding, and they will make sure you look good doing it! This venue gave me a truly magical experience and lovely memories. I hope to come back in the future to vacation at LCC with my family so that we can relive it! Cedar Skies was perfect for my wedding day. It is a brand new facility with a unique touch to detail. The staff was amazing and planned my entire wedding perfectly. The guest had a blast and still talk about our wedding to this day. Most of our guest were able to stay on site in their beautiful log homes. So instead of it being a day for our wedding, it was an entire weekend dedicated to our celebration. (Since their resort is located right on Lake LBJ) I cannot say enough about this place. Except maybe give it 10 stars! We are already talking about going back for our anniversary or making it a family reunion. Cedar Skies at Log Country Cove is absolutely amazing! We looked at this venue before the barn was being built but they showed us some plans and we could tell what their taste was like based on the log cabins on the property, so we crossed our fingers and booked it anyway. This venue could not have been more perfect for our special day! A huge part of our guests rented the cabins on the property and so it was like a big party all weekend. 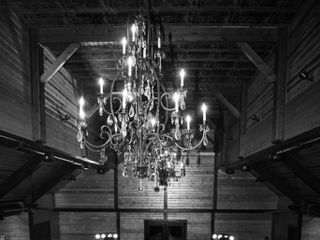 The barn is gorgeous with chandeliers hanging from the vast ceilings made of rusted tin. Not to mention, the landscaping is beautiful around the venue with plenty of great photo opportunities. The staff was great and all the recommended vendors we used were amazing as well. All of our guests still talk about our wedding and compare it to others. We were very pleased and will remember our wedding day forever. Working with Maegan and Manda was a wonderful experience!! They were professional, fun, and very responsive! I would highly recommend. Everyone had so much fun. Best wedding ever??? ?